From Novi Sad, we drove South to Zasavica, where we stayed next to the Special Nature Reserve of Zasavica. 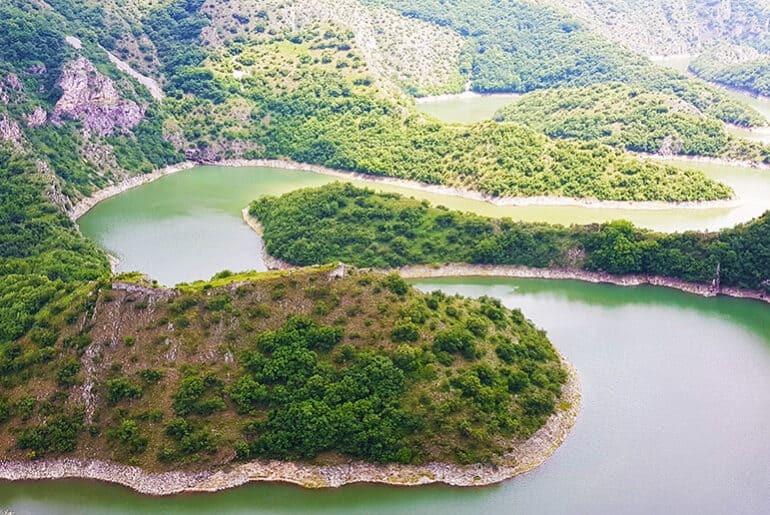 The Nature Reserve of Zasavica is a protected area and is special in that it is one of the last authentically preserved wetlands in Serbia. 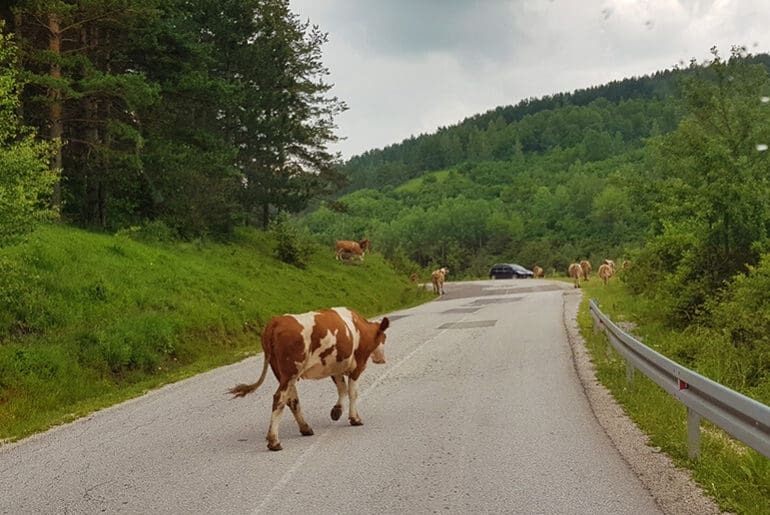 Due to its location on the Zasavica River and the fertile soil, it has become home to many unusual and endangered species, offering a large biodiversity. It is also the only location in Serbia where you can find old breeds of domestic animals. We arrived late so the restaurant was closed and we literally had the whole place to ourselves. It was an enchanting setting with a restaurant and rowing boats that you could take out on the river. We had a really fun time petting all the domestic animals, especially the goat who kept getting his head stuck in the bars! The next morning we did another long drive, this time down South to the town of Zlatibor. The roads were heavily patchworked and wove up hills and down valleys so that we probably averaged 40km per hour for the 5 hour drive. The town of Zlatibor is situated in the mountainous Dinaric Alps and is Serbia’s main skiing and hiking centre. It is named after the golden colour of its pine trees and is known for its authentic local cuisine and fun activities. The campsite in Zlatibor was on a hill with a gorgeous view overlooking the town and a super friendly manager. He recommended a restaurant to us that was further up the hill so we grabbed the bikes and set off. We easily found the restaurant and my word, what fantastic views! People were smoking inside – as they do in Serbia – so we opted to sit on the balcony. It was chilly but the scenery was worth it. The waiter brought the menu and we were stumped. Not a word of English and not one word resembled anything my brain could imagine. Friends of ours had been this way a few weeks earlier and after a quick WhatsApp, they suggested we choose the most expensive thing on the menu. It turned out to be a fabulous choice! A veal, tomato and potato stew that was absolutely delicious. As always we shared the meal and still couldn’t finish between the two of us. I’m not sure who eats manages these enormous portions? Getting back to Miles that evening, the lights were not working. My heart sank! We’d just spent all this time in Belgrade getting everything fixed and now this! The next morning I asked the campsite manager if he knew someone who could help. Not even 10 minutes later, two guys arrived in a beat up old VW. They had a quick look, but they were auto-electricians and the issue was not with the car electrics. No problem. Another phone call and also, within 10 minutes the electrician arrived. He pottered about trying to find the issue, which turned out to be a fuse, which he replaced and voila the lights worked again! I asked how much I needed to pay him for the repairs and he waved his hand, said it was nothing and drove off. I was gobsmacked at his kindness and generosity and it epitomised the amazing nature of all the Serbian people we have met. They are truly wonderful! The next day we woke to pouring rain, which continued unabated for the next 3 days. 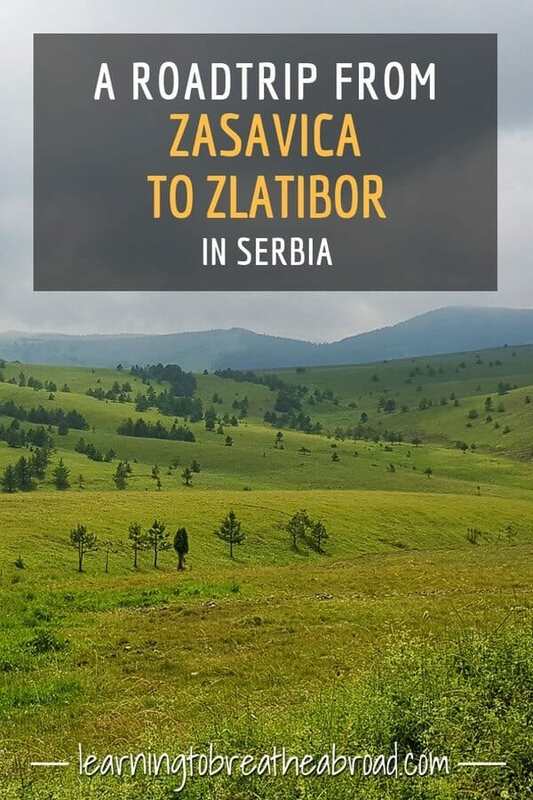 Although we would have loved to hike in these gorgeous mountains and to have seen some of the sights, we decided to push on to greener, dryer pastures, so left Zlatibor without seeing much. 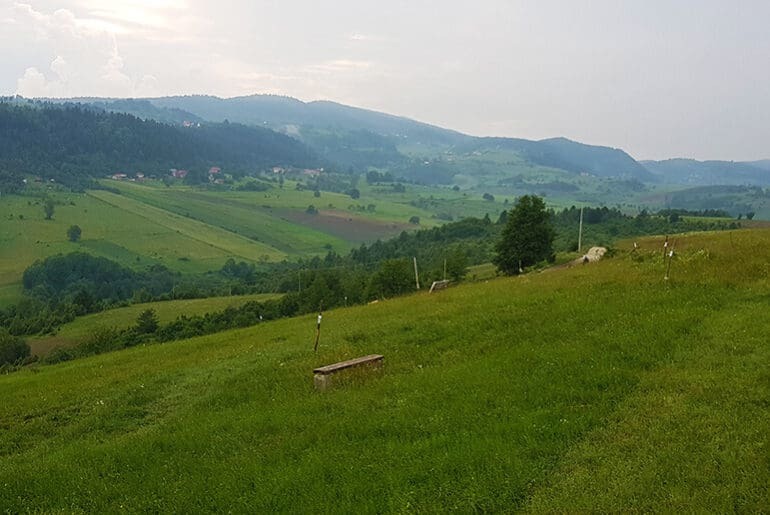 Perched on a hill above the town of Zlatibor, this campsite has lovely views, full facilities and the washing machine was FREE! !